WHAT: American art conservationist Frank Stokes (George Clooney) leads a small platoon of specialists into Europe during the final year of World War II to protect various monuments and buildings from being needlessly destroyed by Allied forces, as well as locate and retrieve the Nazi-stolen paintings and sculptures hand-picked for Hitler’s planned Führer Museum. 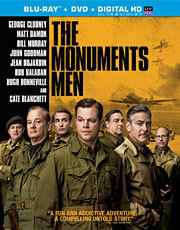 WHY: Based on the 2009 book by Robert M. Edsel, the real-life story of the Monuments Men is practically tailor-made for the big screen; a unique slant on the typical WWII movie that, at least on paper, appeared to be equal parts “Ocean’s Eleven” and “Inglourious Basterds.” Unfortunately, it’s nothing like that at all. The movie is stuck in first gear for most of its sluggish two-hour runtime, and by the time it finally begins to take shape into the film that many were expecting from the start, it’s over. It’s also a giant mess tonally, shuffling back and forth between lighthearted comedy and serious drama with such reckless abandon that it’s as if co-writer/director Clooney was caught in two minds as to which kind of movie he wanted to make. That carries over to the screenplay as well, which is packed with so many different subplots that there’s no room for character development. We never get to know any of the men beyond their names and job titles, and they spend so much time apart on side missions that they barely have the chance to interact as an ensemble. 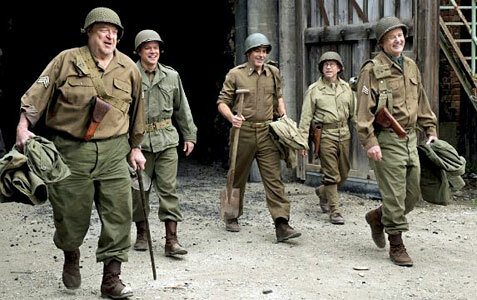 “The Monuments Men” is a lot better than most of the dreck that’s forced down our gullets during the winter season, but for a film overflowing with promise, it’s hard not to feel the sting of disappointment. EXTRAS: The Blu-ray release includes a pair of behind-the-scenes featurettes, two deleted scenes, interviews with the surviving members of the Monuments Men mission, and a profile on the real-life woman that served as the inspiration for Cate Blanchett’s character. WHAT: 17 years after his tribe was slaughtered and he was sold into slavery, gladiator Milo (Kit Harrington) catches the eye of a Roman lanista and is shipped off to Pompeii. But when he’s forced to fight in the upcoming games by the smarmy Senator Corvus (Kiefer Sutherland) – the man responsible for his family’s death – Milo is given a chance to exact revenge when Mount Vesuvius suddenly erupts, causing mass panic throughout the city as it crumbles. WHY: Paul W.S. Anderson must have had “Titanic” playing on a loop for his cast and crew during the making of “Pompeii,” because the director’s sword-and-sandals/disaster movie borrows heavily from the James Cameron drama. That’s not to say that “Titanic” was a wholly original story, but you’d think that Anderson could have done a better job of not making its influence so blatantly obvious. Of course, everything about “Pompeii” feels half-assed – from its bland romance, to its terrible dialogue, to the worthless addition of 3D, to some incredibly dull and uninspired action. The final act in particular should have been more fun, but instead, it’s a chore to sit through as a never-ending chain of CG explosions is vomited across the screen. You can barely tell what’s going on amid all the death and destruction, not to mention the absurdity of watching two men fight over a girl as giant fireballs rain down on them. Roland Emmerich may be criticized for his schlocky disaster movies, but at least he makes a spectacle out of it. 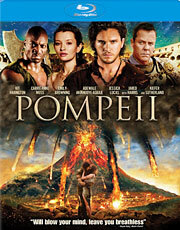 That’s something that “Pompeii” is desperately missing, because for a film about gladiators and an active volcano, it’s about as exciting as a grade school science fair project. EXTRAS: In addition to an audio commentary with director Paul W.S. Anderson and producer Jeremy Bolt, there’s a behind-the-scenes look at making the movie, five additional featurettes (on the cast, special effects, stunts, production design and costume design) and a whopping 20 deleted scenes. WHAT: When CIA operative Ethan Renner (Kevin Costner) decides to quit the international spy game after he’s given only a few months to live, he’s persuaded into doing one last job in exchange for an experimental drug that could save his life. Furthering complicating matters is Ethan’s estranged daughter (Hailee Steinfeld), who he’s foolishly agreed to look after while hunting down a dangerous terrorist. WHY: On the surface, “3 Days to Kill” had the potential to do for Kevin Costner’s career what “Taken” did for Liam Neeson. After all, both movies were co-written by Luc Besson and contain similar father-daughter relationships imbedded within an action-thriller plot. 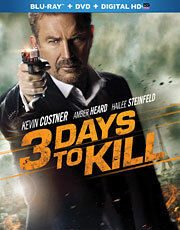 But unfortunately, “3 Days to Kill” is nowhere near as good as “Taken,” let alone its inferior sequel. Though Costner turns in a solid performance as usual, the film is lacking any sort of consistent tone, with the forced attempts at quirky humor missing their mark entirely. The scenes with Amber Heard’s CIA handler are especially painful to watch, not only because she’s a terrible actress, but because her character comes across more like a high-end prostitute than someone who could be considered a “top shelf” government agent. The whole thing is utterly ridiculous (from Ethan’s conveniently timed hallucinations, to the clichéd teaching moments between him and his daughter), and although you could say the same thing about any of Besson’s scripts, “3 Days to Kill” takes the cake as one of the Frenchman’s dumbest movies in recent memory. EXTRAS: There’s a making-of featurette, a short profile on director McG and an interview with a former CIA agent. Viewers can also watch an extended cut of the movie, which includes about six minutes of additional footage. If February is known for anything, it’s the barrage of romantic films released in conjunction with Valentine’s Day. And in keeping with tradition, there are several to choose from this year. But while past Februarys haven’t been very promising from a guy’s point of view, there’s plenty to look forward to in the 2014 edition, with no less than four action movies (including a remake of an ‘80s cult classic) and the latest from George Clooney and an animated film that’s just as much for adults as it is for kids. What: An ordinary LEGO minifigure, mistakenly thought to be the MasterBuilder, is recruited to join a quest to stop an evil LEGO tyrant from gluing the universe together. Why: It’s not very often that I get excited about an animated film, but as a closeted LEGO fanatic, “The LEGO Movie” is one of my most anticipated releases of the year. The fact that it’s taken this long to make a film based on the hugely popular toy brand is shocking, not only because it’s a dream project from a marketing standpoint, but because the very nature of LEGOs provides an almost endless supply of creative possibilities. This could have easily been ruined in the hands of someone else, but based on the materials released so far, it appears that directors Phil Lord and Christopher Miller (“Cloudy with a Chance of Meatballs,” “21 Jump Street”) have struck the perfect chord in making a kid-friendly movie that adults can enjoy as well. What: An unlikely World War II platoon is tasked with rescuing art masterpieces from Nazi thieves and returning them to their owners. What: 17-year-old half-human/vampire Rose Hathaway is dragged back to her boarding school to protect a race of peaceful vampires from the bloodthirsty Strigoi. Why: If “Vampire Academy” comes across as just another young adult book series turned into a film, it’s because it is – a sort of supernatural mashup of “Twilight,” “The Hunger Games” and “Divergent.” But while the Richelle Mead novel on which it’s based sounds about as fun as a trip to the dentist’s office, the movie version looks a lot more enjoyable thanks to the involvement of sibling duo Mark and Daniel Waters. The former directed the hilarious 2004 comedy “Mean Girls,” while the latter wrote the screenplay for the precursor to that film, “Heathers.” And if the trailer is anything to go by, “Vampire Academy” strikes a very similar tone, albeit with the added benefit of some action. For every successful YA book adaptation, however, there are five failures, so history certainly isn’t on its side.